Here is how April 2016 ($317.80 compares with previous months. April 2015: $254.65, increased by $63.15, 24.80% increase. January 2016: $308.43, increased by $9.37, 3.03% increase. 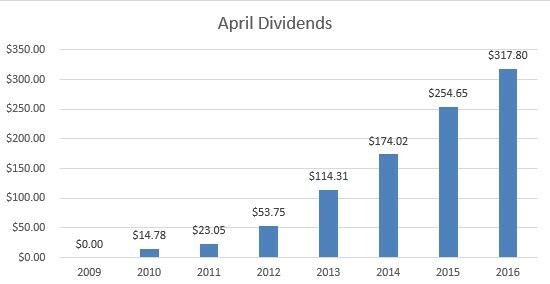 The below chart shows April dividends over the years. Looking forward to seeing this chart go higher and higher. The below chart shows the dividends that I have received until April each year. By April last year, I had received $851.92 and it has grown to $1,168.67 this year. 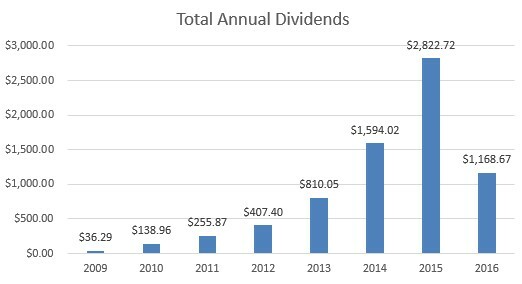 The below chart represents the total annual dividends. Looking at the numbers below, I have received little over 41.40% of my entire 2015 dividends in 4 month in 2016. With April dividends of $317.80, I have received 31.80% of my 2016 target of $3,675.00. That is a good start for the year, though there are dividend cuts announced that will definitely have an impact in the rest of the year. 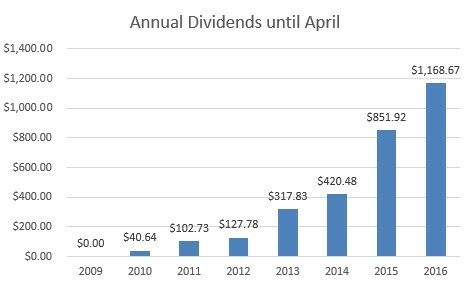 The dividends page will be updated to reflect the April dividends. Really nice month! PM is the one stock I wish I had kept. It is on a major run. Keep up the good work!